Adriaan van Woudenberg was the solo hornist in the Royal Concertgebouw Orchestra in Amsterdam for 41 years and also the hornist in the Danzi Wind Quintet, one of the most highly regarded quintets active in the 1960s and 1970s. He was also an exponent of the natural horn. 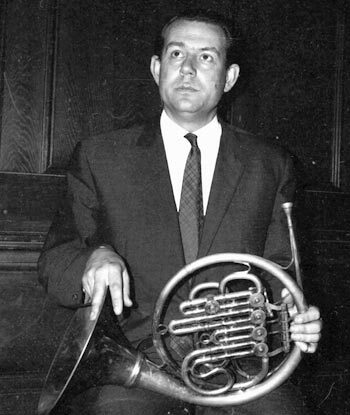 Woudenberg was born in 1925 in Amsterdam and studied horn at the Conservatory there with Richard Sell. In 1943 he won a position in the Concertgebouw Orchestra and was promoted to solo horn in his second year, a position he held until 1985.During his tenure in the orchestra, he devised the system of co-principals that has become standard throughout the world. Woudenberg made many recordings with both the orchestra and the quintet and collaborated with Hermann Baumann in recordings of natural horn. Many composers wrote works for the quintet, including Rob du Bois, Peter Schat, Ton de Leeuv, Misha Mengelberg, and Josef Tal. Woudenberg has taught at the conservatories of Maastricht, Tilburg, and the Sweelinck Conservatory in Amsterdam. His students include Fergus McWilliam, Sören Hermannson, Peter Steinmann, and Herman Jeurisson. Woudenberg was elected an IHS Honorary Member at the symposium in London in 2014.